Sushi & Japanese noodles - Restaurant, Takeaway and Delivery! Would you like to enjoy food in a cosey atmosphere, then we are happy to welcome you in the restaurant. 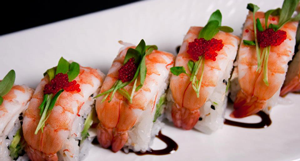 You can choose among a wide assortment of japanese dishes! You can order online on this website and have your dish delivered or come get it at our restaurant. De online ordering menu is slightly different than in the restaurant, so that it only contains dishes that still taste great even after being transported! Ikura Sushi is a Japanese restaurant in Ghent presenting sushi and Japanese noodles. Check out our menu, order online or enjoy dinner in our restaurant, and discover that Ikura Sushi creates extraordinary dishes for you!